It’s the most frequently asked question in our hospital and it’s one that can bring any dog owner to us shaking their head and wanting to scream. There is so much conflicting information out there regarding feeding dogs that is hard for anyone to sort through it all and come up with a good answer! Grain Free? Organic? Limited ingredient? By-Products? What’s good, what’s bad, and what is just bad information? Let’s start with the basics. Science tells us that dogs are omnivores. What this means is that dogs are designed to eat both meat and plant based items and get necessary nutrition from those items. Many people will try to tell you that dogs are the same as wolves, and therefore should only eat meat, but this is not accurate. In 2013, a group of researchers compared the entire wolf genome with the dog’s genome and found two huge differences. The first difference was in regards to the behavior of the dog, and the second was regarding starch digestion. That’s right! Starch digestion was one of the two main differences. Since dogs have evolved, they have gained the ability to digest starches in their diets. What this tells us is that the majority of our dogs can and should have some starches in their diet. Starches come in many different forms, and all of them have different good and bad points. Grains: Many people see grains as a bad thing or just a “filler”, but this is far from the truth. Grains can provide valuable nutrients to your dog, including fiber, vitamins, essential fatty acids, and minerals. Some of them even provide protein that is easier to digest than some meats. Most dogs are very efficient at digesting grains, and utilize their nutrients very well. While some dogs can be allergic to grains, true allergies are pretty rare. Most food allergies are to the protein your dog is eating (chicken, beef, etc), not to grains. Other Refined Starches (such as potato’s or tapioca): Many “premium” dog foods are now offering Grain-Free varieties, and they are substituting potatoes or tapioca starch for the grains. Some of these ingredients actually offer fewer nutrients than some of the grains, and are more expensive. In the end however, they are still carbohydrates and are digested pretty much the same way the grains are. Peas, lentils, etc: Some companies are putting peas and lentils in place of grains. These offer good nutrition and are easily digested by most dogs, but they are considerably more expensive and can make the cost of the food prohibitive. What all this means is that unless your dog has a true allergy to grains, there is no reason they can’t eat a food with grains in it. All dogs should have a good source of protein in their diet. Which protein is entirely up to you and your dog’s individual needs. Chicken, turkey, and beef the most common protein sources found in your dog food and the majority of dogs eat those happily with no issues. If your dog does have food allergies, it is likely going to be to the protein source in the dog food. Therefore, if allergies are suspected, this is the time to try different protein sources. Here is the trick to this though! Not all dog foods have the same quality control. If you and your veterinarian are working on a food trial to determine if your dog has allergies, it’s generally best to go with the food recommended by your veterinarian. The companies recommended by your veterinarian make sure that your food ONLY has the protein they say it does and not trace amounts of anything else. This is a big sticking point with a lot of people. We have been conditioned to believe all by-products are horrible and that our dogs shouldn’t ever eat those. We’ve even seen where some people say that “by-products” include wood shaving and sweepings off the floor. Here is the truth though! Not all by-products are bad! The definition of a by-product is what is left after the lean meat is removed. That includes liver, kidney, heart, and things like that. A good dog food company that uses by-products generally uses the organ meats, but not the feathers, skin, or feet. Purina posts specifically that they never use parts like feathers, hide, hair, or intestinal contents. This means we shouldn’t discount a food simply because they use by-products, as the organ meats contain a lot of quality protein and good nutrition. 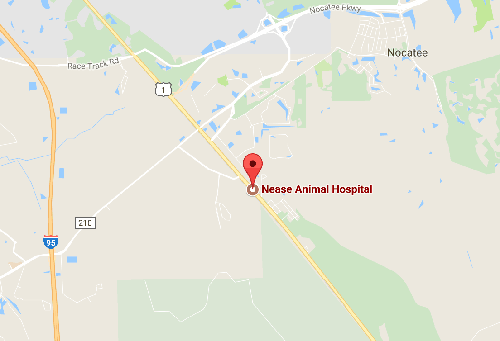 As a rule, we here at Nease Animal Hospital prefer a good, home cooked food for your dog PROVIDING that is has been designed by a qualified nutritionist and you follow their recipes exactly! This is important because if you don’t follow the recipes, the food will not be balanced. Balanced nutrition is essential to optimum health of your dog. Feeding foods that are unbalanced can and will cause long term health problems. So, if you have the time for home cooking your dog’s meals, and it’s something you want to do, you have a couple of options. You can have a qualified veterinary nutritionist such as the ones at Tufts University design a home cooked diet for you. Then, simply follow the diet plan! There is another website you can check out is PetDiets.com. If your pet has a medical condition, which requires more specific dietary needs, your veterinarian can request a nutritional consult and have a customized diet created. You can also go to the website BalanceIT! They will also design you a custom, balanced diet for your dog. These options require a referral from your veterinarian, and they will take any health issues or problems your dog may have into account when designing the diet. What you don’t want to do is follow recipes that you find on the internet. Most of those were designed by people who are not trained in veterinary nutrition, and are not balanced for your dogs needs. Raw diets are a good alternative for some dogs. Again, if you want to create a raw diet for your dog, make sure to use a veterinary nutritionist to design the diet for you. You can also use a commercial raw diet that has been pre-balanced. Before you choose a commercial raw diet, make sure they are working to make sure each batch of food they produce is balanced for your dog’s needs. Some of the smaller companies may not be testing every batch to ensure that your dog is getting a balanced diet. Commercial kibbles are what most of our dogs eat. They are convenient, easy to store, and less expensive than home cooked and raw diets. As with a commercial raw diet, make sure that the brand you choose is doing quality testing on every batch of food they produce to make sure it’s balanced. A little research on their website or a call to them should be able to get you that information. Whatever brand or type you choose, make sure it’s the best quality you can afford for your pet. Nutrition pays such a huge role in your dog’s life that it’s important to make good decisions on their behalf. If you are having issues deciding on the right food for your dog, make an appointment to speak with Dr. Esra! She is always happy to discuss nutrition and help you find the best food for your dog!